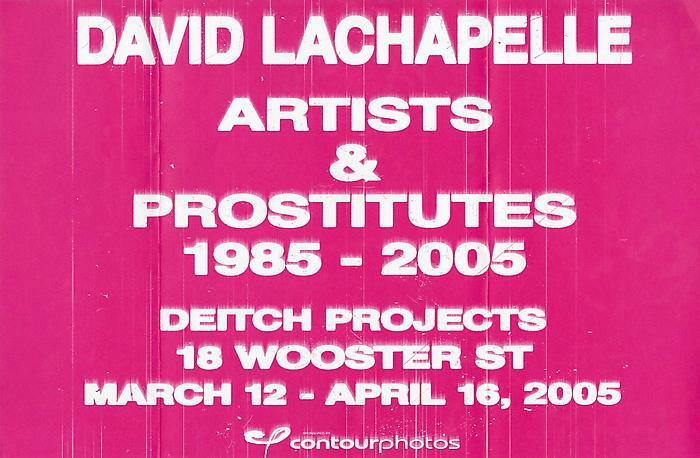 Deitch Projects is excited to present Artists and Prostitutes, a retrospective by David Lachapelle. 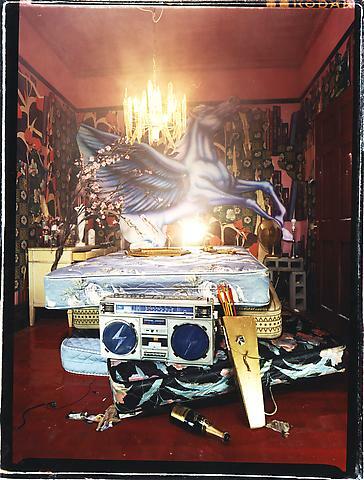 LaChapelle is one of the most innovative and creative photographers working today. He has photographed some of the biggest celebrities and personalities in the worlds of music, entertainment, fashion and art. His work has been featured on numerous magazine covers around the world. In addition to still photography, LaChapelle has directed music videos for pop music stars such as Jennifer Lopez, Britney Spears, Whitney Houston and numerous others. Artists and Prostitutes will showcase 3 oversized L.E.D. 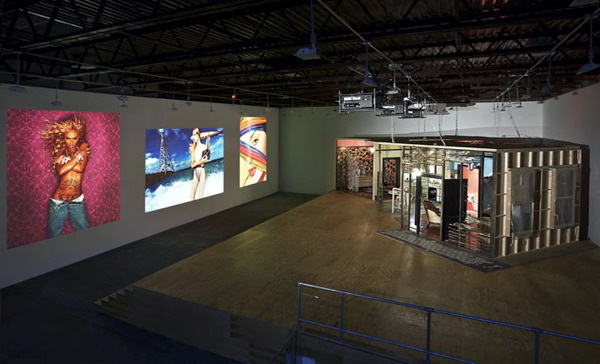 projection screens (15 feet x15 feet) featuring a collection of images taken throughout LaChapelle's illustrious career. 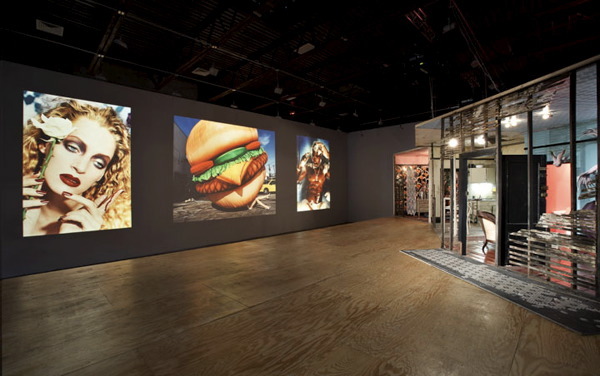 To add to the excitement, LaChapelle will also install a life-sized set in the gallery allowing visitors to freely experience a slice of "LaChapelle's world". 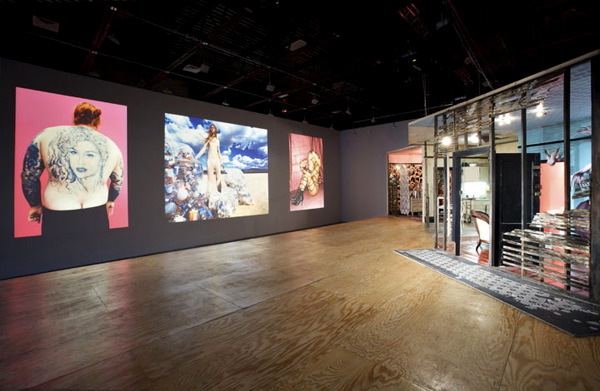 On April 2, 2005, a select group of collectors and press will be invited to watch the same set serve as the backdrop for a LaChapelle photo shoot featuring Pamela Anderson, Courtney Love & LaChapelle muse, Amanda Lepore. A selected image from this shoot will grace the cover of LaChapelle's upcoming book which features a collection of new photographs following in the steps of the hugely successful "LaChapelleland" and "Hotel LaChapelle". LaChapelle recently designed and directed, The Red Piano, Elton John's stage show at Caesar's Palace in Las Vegas. This summer, Artists and Prostitutes, the book, will be published by Taschen Books. Also later this year, David LaChapelle's feature-length documentary, Rize, will be released by Lion's Gate Films. LaChapelle continues to photograph editorials for Vanity Fair, Italian Vogue and Interview Magazine.